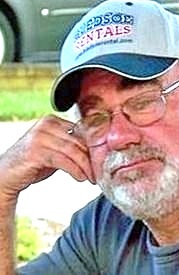 Steven C. Cox, 67, of Olathe, Kansas passed away surrounded by his family on Monday, November 2, 2015. He will forever be remembered as a beloved companion, father, grandfather, brother, uncle and friend to everyone he met. Steven was born on February 25, 1948 in Gardner, Kansas to William C. and Hazel R. (Rousselo) Cox. Steven worked as a carpenter his adult life. His real passion was of the 2 to 4 wheel variety. Steven loved the sound of a supped-up motor. Whether it be a go cart for his kids and grandkids, or a dragster he would run up and down the street. He was always looking to rebuild or repaint, making some old car loud and shiny. There were a variety of cars in and out of his life and his blue eyes sparked when he could show them off. Steven is preceded in death by his parents William and Hazel Cox, sister, Connie Macon, brother Larry Cox and brother-in-law Tommy Thompson. He is survived by his devoted partner Barbara Brown of the home, three daughters, Stephanie Cox and her partner Tim Razo of Olathe, Kansas, Andrea McGuire and her husband Scott of Gardner, Kansas, Ariana Vasquez and her husband David of Shawnee, Kansas and one son Russell Cox and his wife Jessica of Las Vegas, Nevada. Left behind to cherish his memory are his 9 grandchildren and 1 great grandchild. He will be sadly missed by his two brothers, Ronnie Cox and his wife Sandra of Olathe, Kansas, Kenneth Rousselo and his wife Tina of Gardner, Kansas, two sisters, Loretta Thompson and Sandra Webster both of Olathe, Kansas and his two faithful companions “Sadie” and “Bella”. Steven is also survived by Barbara’s children, Lisa Jepsen (David), Gina Law (Mike), Laurie Hook (Shane), Stacy Greenlee (James) and Lynsay Dillard (Salvano). In addition to, Barbara’s 21 grandchildren and 13 great grandchildren. Funeral services will be 1:00 p.m. Monday, November 9, 2015 at the McGilley & Frye Funeral Home 105 E. Loula St. Olathe, Kansas. Interment in Oak Lawn Memorial Gardens 13901 S. Blackbob Rd. Olathe Kansas. Visitation will be 11:00 a.m. -1:00 p.m. Monday prior to the service at the funeral home. A gathering of mourners, to celebrate his life, will be held at the home of Stephanie Cox 1409 West Prairie Terr. Olathe, Kansas.